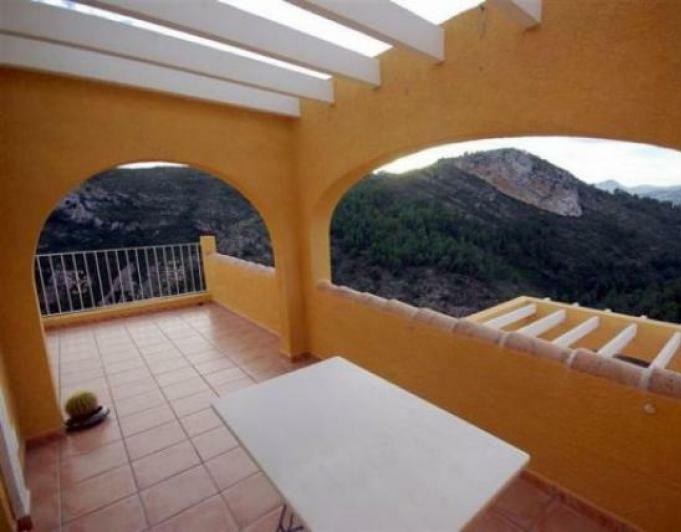 APARTMENT FOR SALE ,CUMBRE DEL SOL. A 2 bedroom, 1 bathroom apartment in Pueblo De La Paz, with an open plan living, kitchen, dining area. Double glazed patio doors lead from the sitting room onto the terrace to take in the open views. This apartment is only a few minutes walk from a supermarket, pharmacy, restaurant and bars and a very short stroll from the huge community pool. This 2 bedroom apartment in Pueblo De la Paz was reformed in 2014. An open plan kitchen, dining living area with patio doors leads to a terrace. There is a community pool and garden area and the property also has sea views. A short stroll away is a supermarket, restaurant, and bars. TOWN HOUSE FOR SALE CUMBRE DEL SOL. This good sized 2 bedroom property has 2 bathrooms and is on two floors. On the gorund floor is the kitchen and the open plan dining/ living area with double glazed patio doors leading to a terrac. Stairs lead up ot the two bedrooms and bathrooms. This apartment has 3 double bedrooms, 2 bathrooms and an open living, kitchen, dining area. Double glazed patio doors lead to a terrace with panoramic sea and mountain views. The property benefits from the nearby, large community pool. Located only 500m from a supemarket, restaurant and bars. 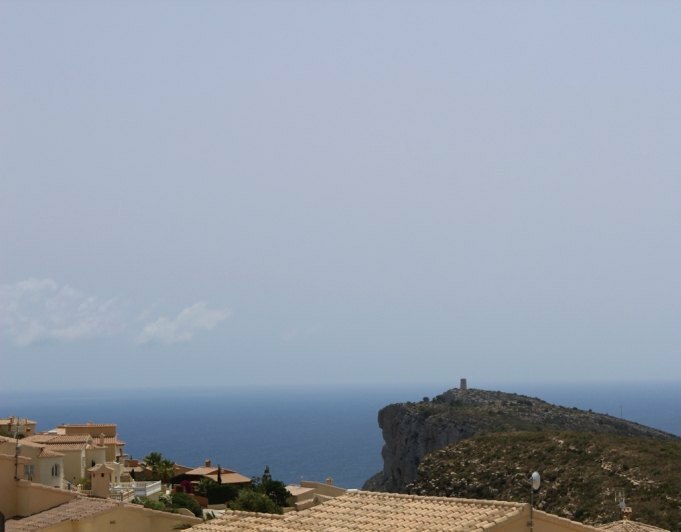 Located on a high ground, in the outer skirts of Benitachell and only 10 minutes from Moraira, this spacious House linked is a very good property for full time occupation or an excellent rental investment. The property is in perfect condition, is fully furnished and ready to move into.There are 3 bedrooms, one ensuite, bathroom, a well equipped kitchen with dishwasher, fridgefreezer, electric oven / hob and dining room. The master bedroom is on the main floor and 2 bedrooms plus a level. Lounge opens onto a sunny terrace of good sized and a beautiful Mediterranean garden, which is totally private.There is also a large roof where you can appreciate the stunning views over the Valley towards the Bernia range and enjoy the stunning sunsets of Spain.At the front of the property There is another terrace area perfect for a coffee morning in the light of the Sun or an alternative to the shade in very hot days of the summer. 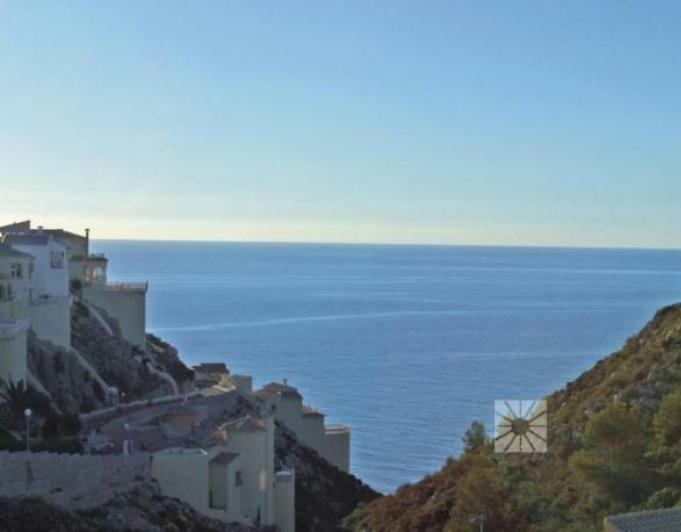 Plot 830 m2 for sale with Sea Views in Cumbre del Sol. 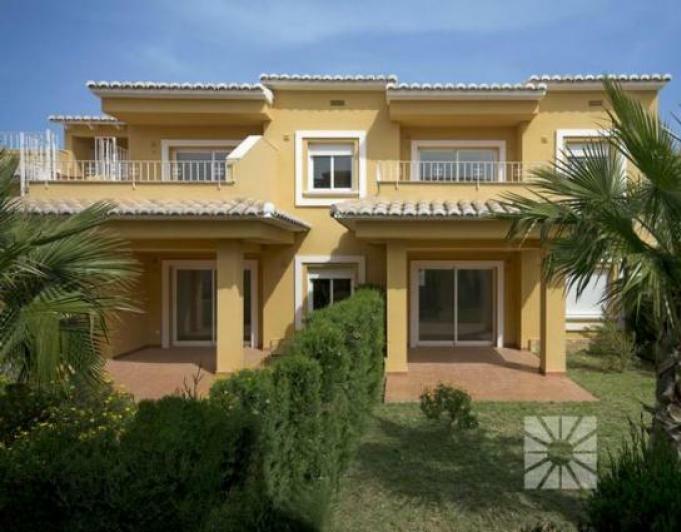 Semidetached apartments, over two levels, for sale in Benitachell. The ground floor apartments have a terrace with private garden. The upper level apartments have a terrace with BBQ. 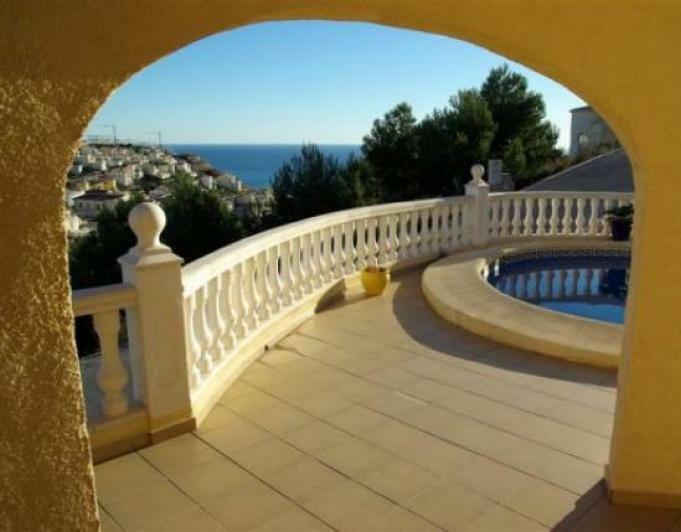 This modern duplex apartment has stunning views across the Mediterranean. Consisting of 3 bedrooms and 2 bathrooms with an American style kitchen, lounge diner and large open terrace. 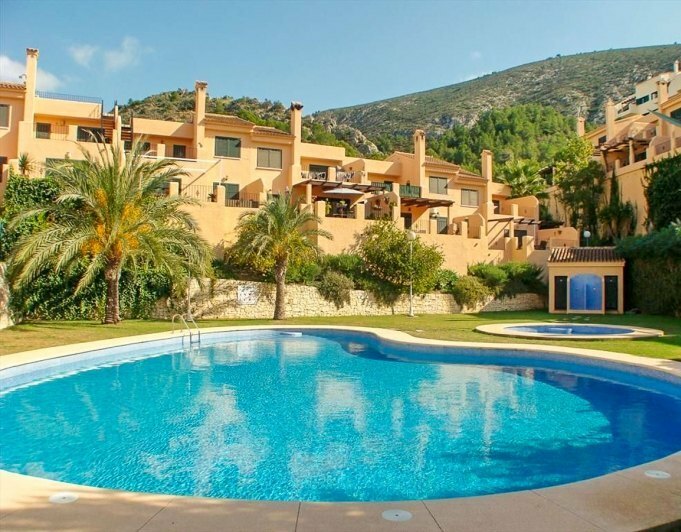 This is a fantastic newly reformed apartment with spectacular panoramic sea views located in Cumbre del Sol. The apartment is bright, large and has a modern design. It is in impeccable condition as it has been completely reformed this year. It has two bedrooms. The main bedroom looks out to the terrace and it's breathtaking panoramic sea views, in this room there is a double bed, built in wardrobes and an ensuite bathroom. The second bedroom has two individual beds and built in wardrobes.The kitchen is modern and fully equipped with all appliances and opens up into the dining/living room area. The property boasts double glazing, hot and cold air conditioning, fibre optic wifi, satellite television and sonos speakers installed throughout the property. Brand new apartments for sale on Cumbre del Sol. Quality build and finish with fabulous views. 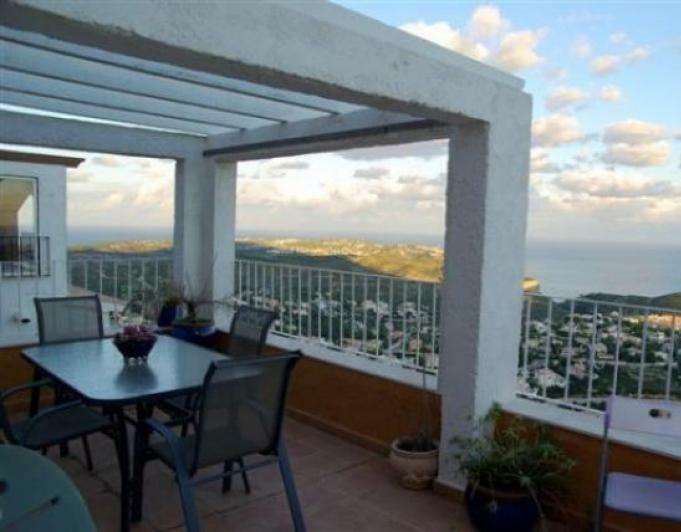 A three bedroom corner apartment for sale with sea and valley views. The apartment is very well finished and ready to move into. 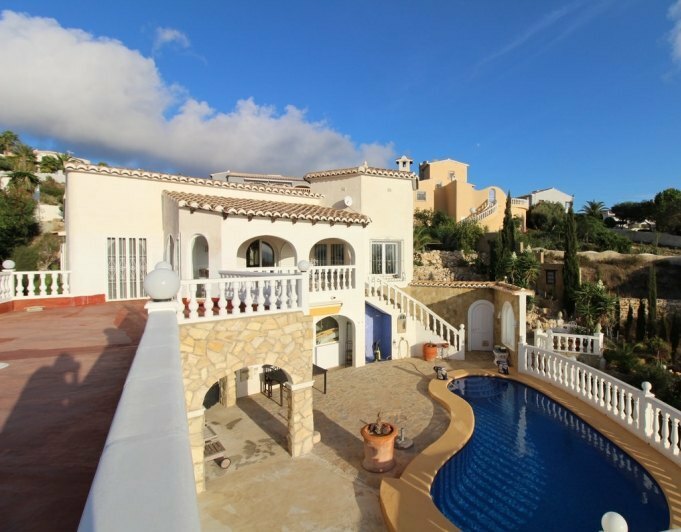 Villa for sale in Cumbre del Sol with beautiful sea views. The villa has 3 bedrooms and large lounge which opens out onto the terrace. Extras include air conditioning, a fireplace and there is a lovely pool and terrace area outside. 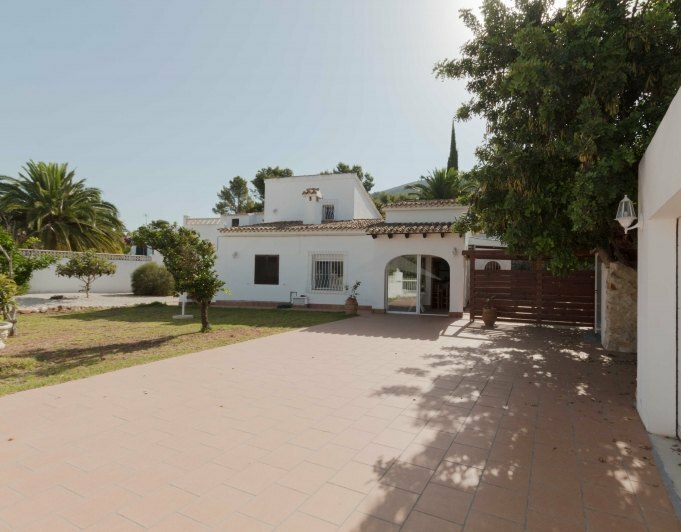 Villa with fantastic views to the sea and the forest park of granadella.This is a traditional style villa of with three bedrooms in a quiet area in the Cumbre del Sol. SouthEast facing. 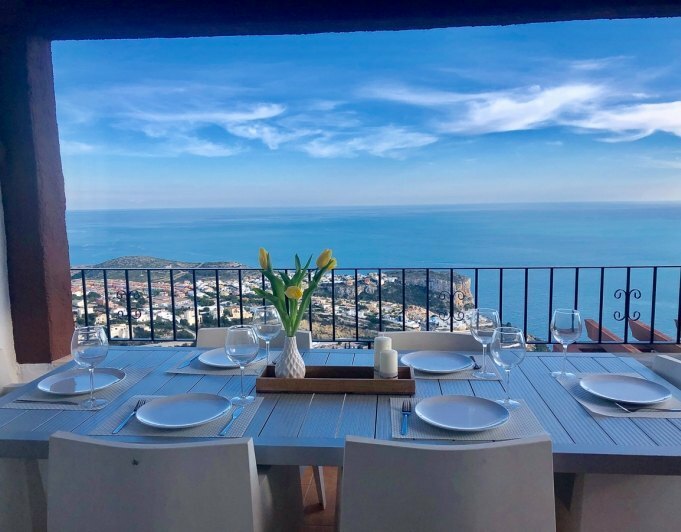 The villa consists of three bedrooms, a bathroom, an open living/dining room area, a kitchen and a large terrace with swimming pool where you can appreciate the beautiful views of the sea and the mountains. It also has private parking. Nice villa with open views.This is a two bedroom villa located in the area of Cumbre del Sol.The villa is divided into two floors. The main floor consists of two bedrooms, a bathroom, a large living/dining room, an open kitchen and a large terrace.Downstairs, on the bottom floor is the basement. In the outdoor area there is a kidney shaped pool and an open plan terrace. This charming rustic property is located just a short walk from all type of amenities and approximately 5 minutes by car from the heart of Moraira.Access to the plot can be either through the pedestrian gate or the electronic sliding door, both leading through the ample tiled driveway to the property and the single garage. From here a set of double glass doors lead into a small glazed in naya where we find the security wooden entrance door that take directly into the lounge/dining area with open plan kitchen, to the right of the kitchen we find a big utility room. An small archway leads into the corridor that divides the accomodation on the ground floor which comprises 2 bigger than average double bedrooms, both with wardrobes and the family shower room. An internal staircase lead to the master bedroom with lots of wardrobe space, ensuite shower room and private terrace with beautiful open views.Outdoors we find lots of usable space, including a BBQ area with covered seating area with a featured wooden pergola. The property has got usage of the large communal pool, tennis courts and basketball court, although has plenty of space for a private pool.The property boasts double glazing through out, gas central heating, partial airconditioning hot and cold and is very well maintained. Charming villa with open views.This is a four bedroom villa located in the area of Cumbre del Sol.The villa is distributed on one floor which consists of four bedrooms, three bathrooms, a large open kitchen, a livingdining room and a naya.Outside we have a spacious terrace with a swimming pool, a shower, a jacuzzi and areas to sit where we can appreciate the beautiful views. 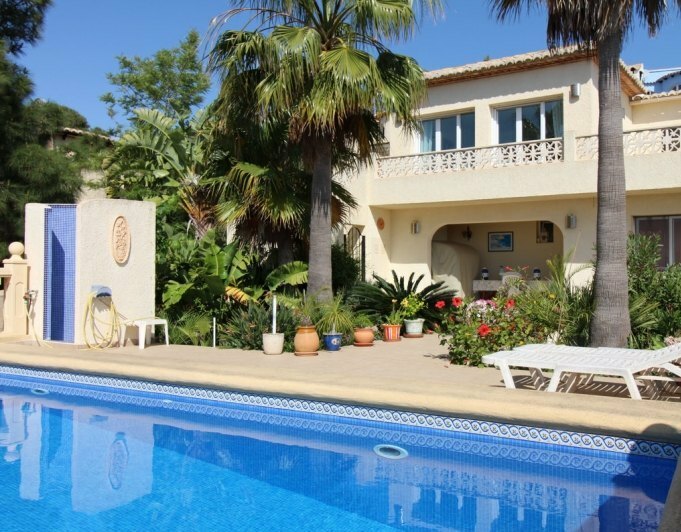 Lovely villa for sale in Benitachell with large porch to enjoy the beautiful open views. As you enter the house you arrive at a large open plan lounge dining room that has been completely reformed. On this level you have two double bedrooms and a bathroom and on the upper floor one more double bedroom and bathroom. The house also has a separate guest apartment of one bedroom and one bathroom. The villa has hot and cold air conditioning,log fire, private pool and garden area. Lovely villa with fantastic views to the sea.This is a traditional style villa of three bedrooms and two bathrooms in the Cumbre del Sol area.The main floor consists of two bedrooms, a bathroom, a spacious open living room, a kitchen and a naya where you can enjoy the magnificent sea views.Downstairs at the pool level, is a separate apartment with a spacious room with an ensuite bathroom. This level has direct access to the terrace. In Benitachell we can find the Cumbre del Sol which is a mountain between the villages of Moraira and Javea. 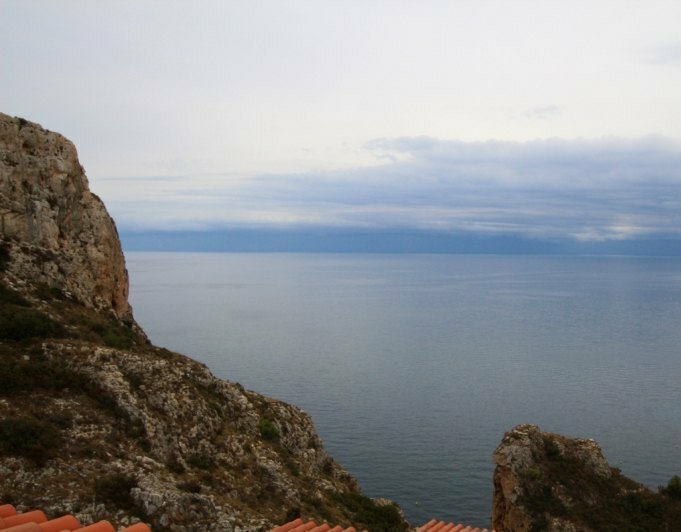 The Cumbres del Sol area in Benitachell offers properties with fantastic sea views at much lower prices than the nearby villages. There are two access roads to the Cumbre del Sol, the northern road from the village of Benitachell and the southern road from the village of Moraira where you will find different facilities such as a supermarket, cafeteria, restaurant, pharmacy, hairdresser and a bar, for more comfort you can choose between a five minute drive to the village of Benitachell or a ten minute drive to Moraira. Cumbre del Sol is also home to the international school Laude Lady Elizabeth, where they prepare for the secondary school in Lliber. Cala Moraig is the local beach, a protected beach at the foot of a hill that has a restaurant (chiringuito) during the summer months, the sandy beaches of Moraira and Javea are only a short drive away. There is also a large green area, the Granadella Natural Park, which is ideal for cyclists, walkers and dog walkers.